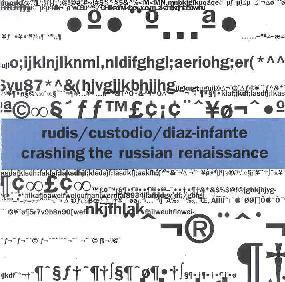 Rudis/Custodio/Diaz-Infante - "Crashing The Russian Renaissance"
Prior to hearing this CD I'd not heard of LX Rudis or André Custodio but the two have an interesting resume. Rudis is described as a multi-disciplinary artist who has worked with Tuxedomoon and Negativeland, done media work for radio and television, and works in all areas of video game production being in the credits of over 40 video games. Custodio is a multi-instrumentalist and sound designer who has worked with The Splatter Trio, Tom Nunn, and Eddie Gale to name a few. His current solo project - Nihil Communication - combines reconfigured samples, digital processing and analog synthesis. On Crashing The Russian Renaissance we have Ernesto on acoustic guitar, violin and voice and Rudis and Custodio contributing a variety of electronics and percussion to create a free-improv sound sculpture experience. Some tracks are heavy on ambience. Others are highly chaotic. And some accomplish both at once. My favorites consist of Ernesto's free-wheeling manic style that showcase his creative instrumental proficiency (the avant-garde free-improv equivalent of rock guitar shredding) as well as his ability to wrench all manner of odd sounds from his guitar. But supporting the guitar will be a banquet of electronic tones, noise, ambient sequences and percussive bits that nicely contrast and cooperate with each other. A sense of fun pervades through many of the tracks which sound like carefully constructed collages of loops and electronic patterns and textures that are both child-like and alien. I really dig the layers of spaced out electronics that dance about as Ernesto does his manic runs up and down the fretboard. Definitely a listening experience that reveals new treasures with repeated listens.